Flowers are blooming all over Jeonju as temperature has risen. Suddenly, spring is everywhere. 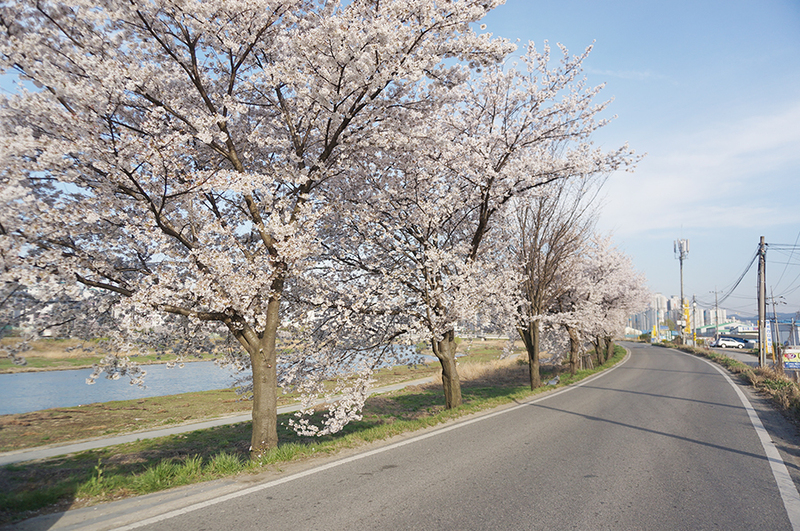 Jeonju has several ‘cherry blossom drive’ routes such as those ones near the Jeonju Zoo and the Provincial Office. But, I visited more locally known one which is about ten kilometers long. As soon as I passed the Chuchundaegyo Bridge (direction Jeonju), I took the riverside road (direction opposite of the Provincial Office). The road narrowed soon. 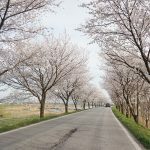 When the apartments disappeared from the sight, I was fascinated by the cherry blossom trees creating the tunnel of flowers from the both sides of the road. There was occasional queue of cars driving by. You may park the car on the roadsides and walk. People were taking pictures with their families, friends, and significant others. Some even appeared to be professional photographers. But I had to be aware of the passing cars since it is a countryside road. After driving along the Jeonjuchun River for a while, I came across the wider Mangyunggang River. Pleasant cool breeze was blowing from the river. The tunnel of cherry blossoms didn’t seem to end. I stopped the car and walked down to the riverbank. I wanted to take pictures with my child. The sprouting fresh greens and the pink of blossoms were telling me that spring is finally here. 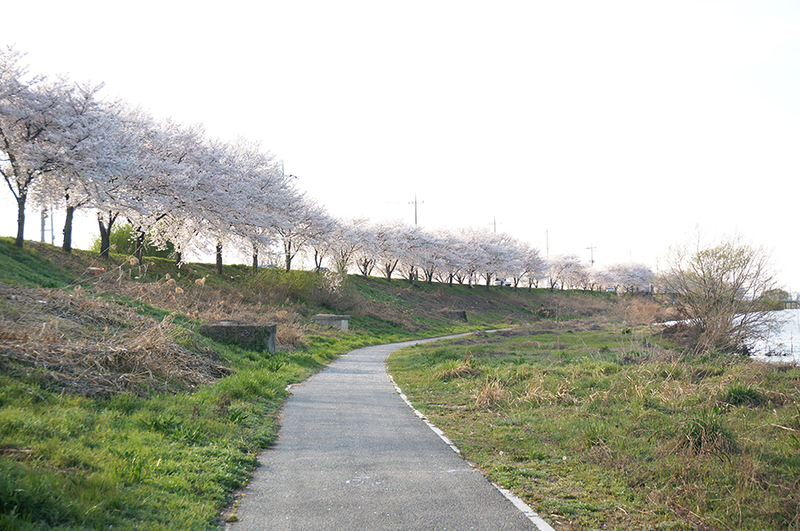 Much of the cherry blossoms usually fall after the spring rain. I recommend going for a drive before the rainy days start! The cherry blossoms still weren’t in full bloom. It would be awesome to drive through the rain of cherry blossom petals scattering in the wind. You don’t have to travel far to enjoy such a picturesque scenery. Must be better if the sky is blue and sun is shining. 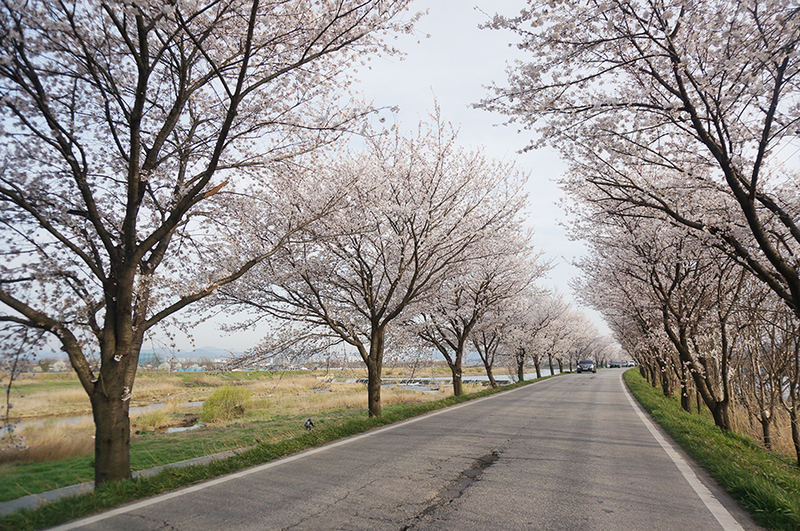 In the coming weeks, I recommend a short drive around Jeonju to enjoy the cherry blossoms and spring breeze. It’s only this time of the year! Jeonju Makgeolli Alley: Endless Flow of Side Dishes Per Kettle! I’ve found several great locations to view the cherry blossoms here! Great driving route with such beautiful scenery! 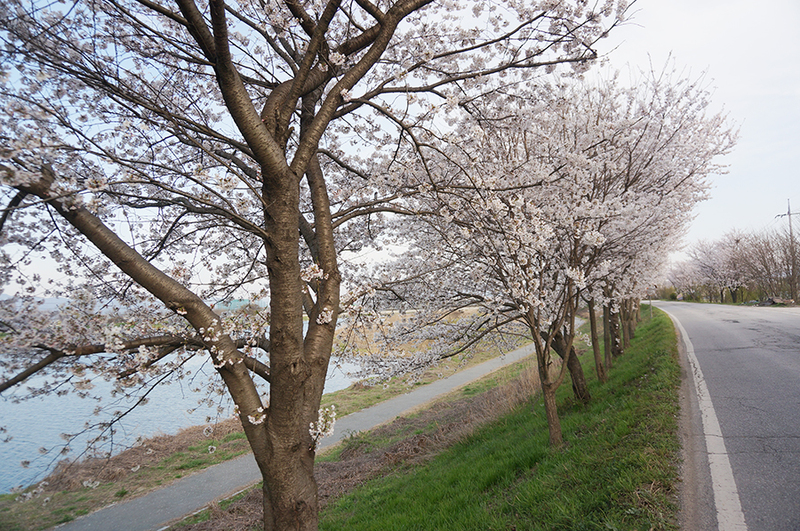 The cherry blossoms in Jeonju are some of the best in Korea I hear! Hope I can see them before they disappear! One of my favorite spots to see the cherry blossoms!!! These pictures are so breathtaking! 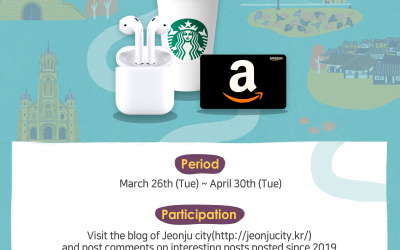 I always wanted to visit Jeonju and I think now is the right time to truly enjoy the spring! The cherry blossoms really make for a Korean-drama worthy spot, haha. I half expect a drama crew to show up and start filming some heartwarming scenes in this spot. 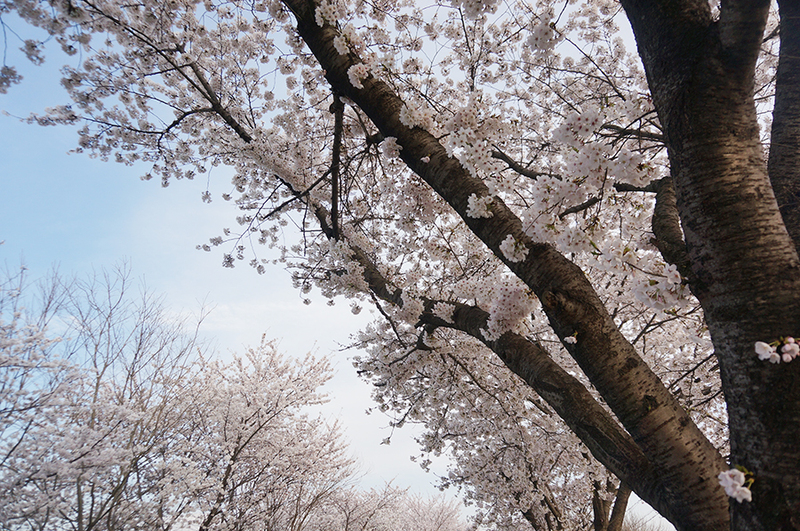 I sure will not miss this experience once the cherry blossoms start to bloom! wow, so beautiful. Surely I should pay a visit next week. Just wonder how long will cherry blossom last? I just love walking to the street of cherry blossoms in jeonju city while listening to bigbang’s Flower Road. It’s never cease to amaze me how wonderful the trees and sceneries in jeonju blends beautifully together. I remember being there in Autumn and it was amazing, such a beautiful place! 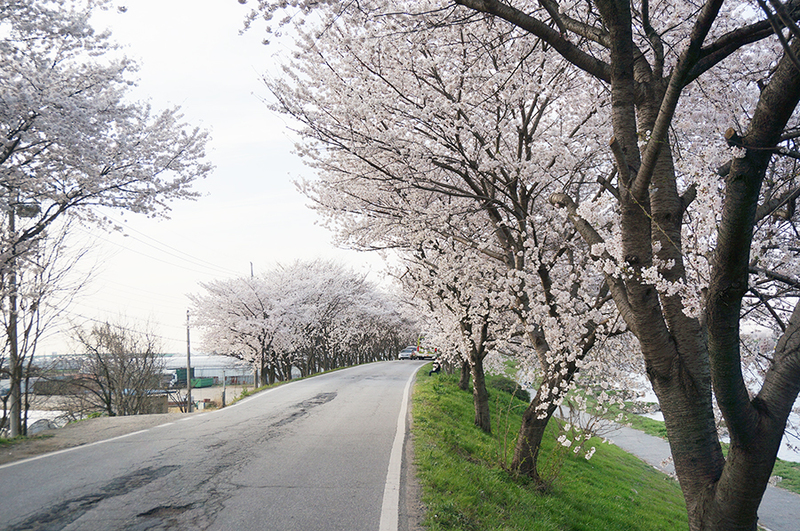 I want to visit Jeonju in Spring to enjoy watching Cherry Blossom. The tunnel of Cherry Blossom looks so beautiful. Cherry blossoms are SO BEAUTIFUL. I’ve always seen them bloom through pictures, but this spring, I’ll finally see them in person! SO EXCITED! 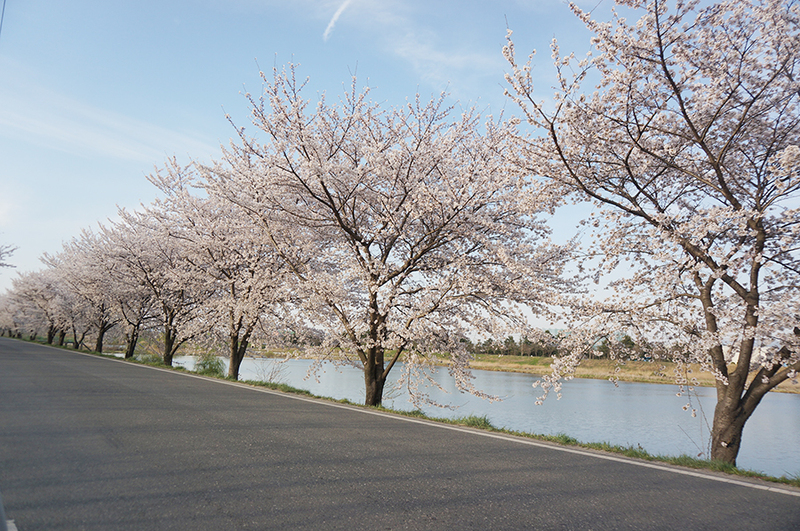 Cherry blossoms are so nice, I will visit there! i’ve been to Jeonju before, it was beautiful even though it wasn’t cherry blossom season I will finitely go again . alll the flowers in korea are the best! 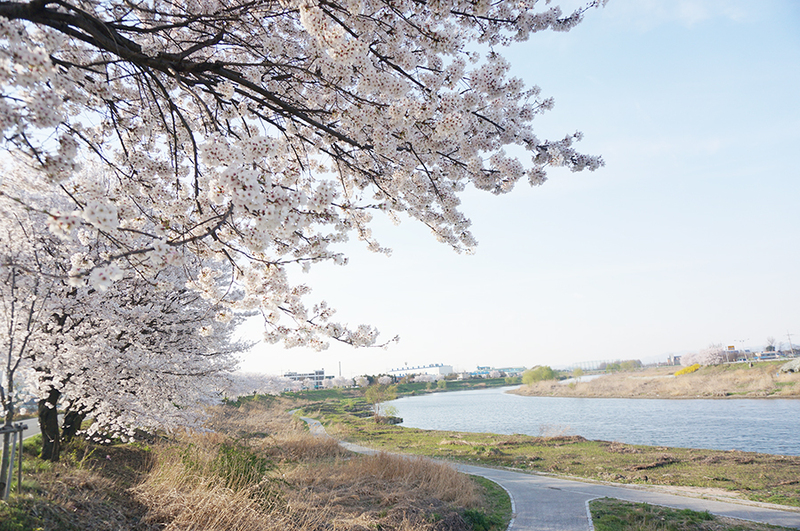 Jeonju has the best scenery for spring in Korea… Let’s visit Jeonju in 2019 guys!!! It’s just too far away from Seoul 😢 is there a faster way? 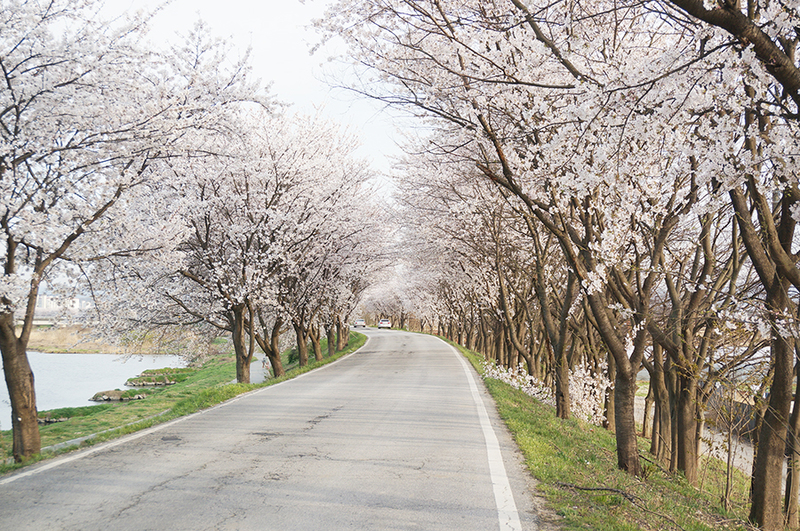 The cherry blossom in Korea is a unique experience that works as a signal to the start of spring, Korea is a country know as the ‘4 seasons country’ and experiencing it in jeonju is one of the best ways to do it. I think you did well on taking the picture with the angles though I think one of the improvement that you could do is make sure the exposure is right and the camera is in focus as some of the picture are slightly a bit out of focus. Wow! The scenery view is amazing!! Definitely, the cherry blossoms are so beautiful and delicate, if you come to Korea in Spring season, I promise you is going to be an unique experience! Specially if you visit to Jeonju, this view looks so wonderful! THAT’S SO BEAUTIFUL omg the cherry blossoms are on another level. I’m so happy that cherry blossom season is finally here! I’m from a tropical country so Korean winters are too much for me to handle, so the warmth of spring makes me really happy, especially if it comes with beautiful scenery such as this one. I would love to go see the cherry blossoms in Jeonju one day! I don’t want the cherry blossoms to go away yet 🙁 They’re too beautiful! I and my wife have been here twice while we was studying there. 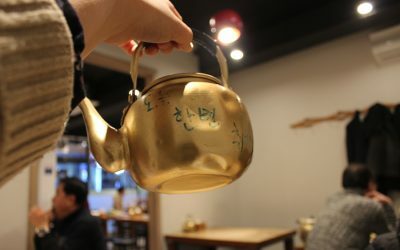 This recalled me lots of our memories on Jeonju. wow! did you both study in jeonju? the pictures look so beautiful that it’s almost unreal. I’m so gonna go to check it out for myself! OMG~ that’s a good place to take beautiful photos!! Simplest way to release stress. Looks so beautiful… Seoul is too crowded to see cherry blossom. 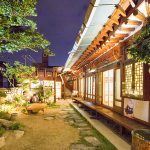 Jeonju seems to be a perfect place for it! right… seoul has too many people. The cherry blossom looks so beautiful!!! There isn’t any Cherry blossom trees in my country so every year I will try to make myself a trip to see Cherry Blossom in Korea, Jeonju will be my next spot! It’s such a shame lots of the cherry blossoms have already disappeared 🙁 I wish spring lasted forever! Beautiful! I hope the flowers are still blooming! Wow, the view looks magnificent! 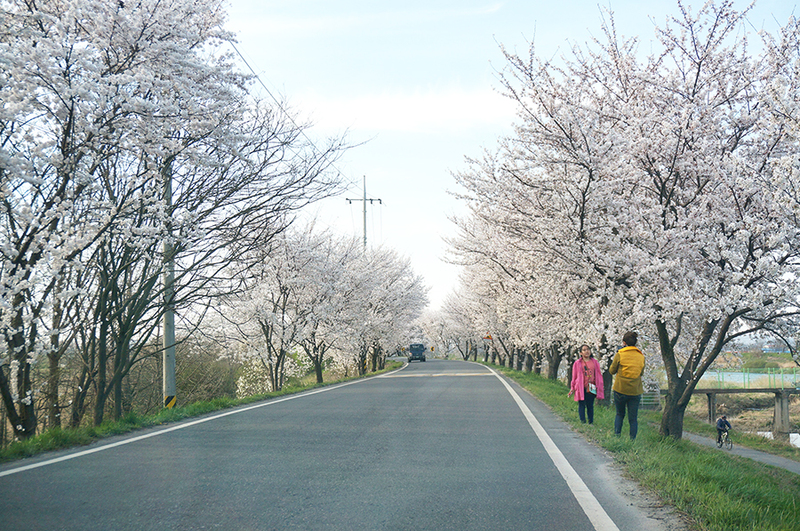 One suggestion, Jeonju city should provide a double deck bus tour for the cherry blossoms. Regretting for not knowing this place earlier~~~~ the cherry blossom is over!! jeonju has the best cherry blossoms!! Doesn’t look busy with people as the cherry blossom in Seoul, which is nice and easy to take pictures haha. 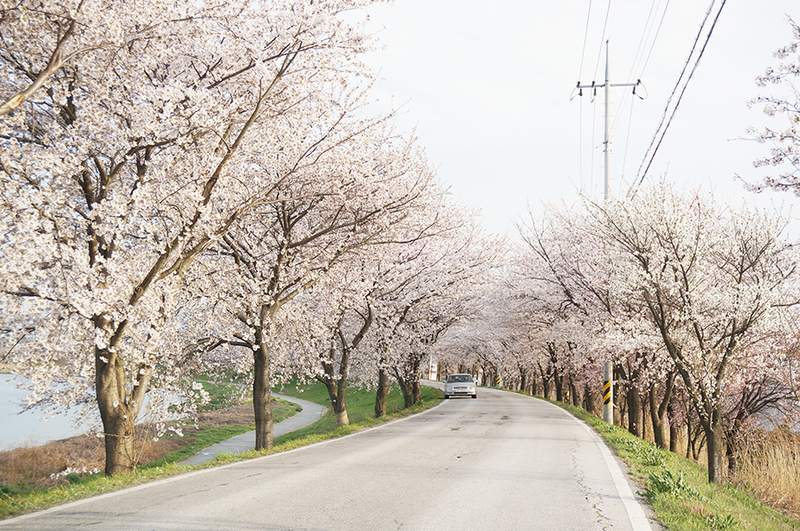 When is the cherry blossom season in Jeonju over? wow. so pretty cherry. i want to go and check how beautiful. I really like this idea, to show people secret jewels around Jeoju and Korea. I will love to visit this place in cherry blossom season! So pretty😭 so sad I didn’t get the chance to visit it before cherry blossom season ended! Wow its look beautiful.I will visit there definitely. The cherry blossoms are so beautiful here in Korea. I’m from California and I’ve never seen them before. Oh my! This looks beautiful. Wish I had seen this post before the cherry blossoms were gone 🙁 Maybe next year. I saw many pretty photos and videos of this places from instagram!!! 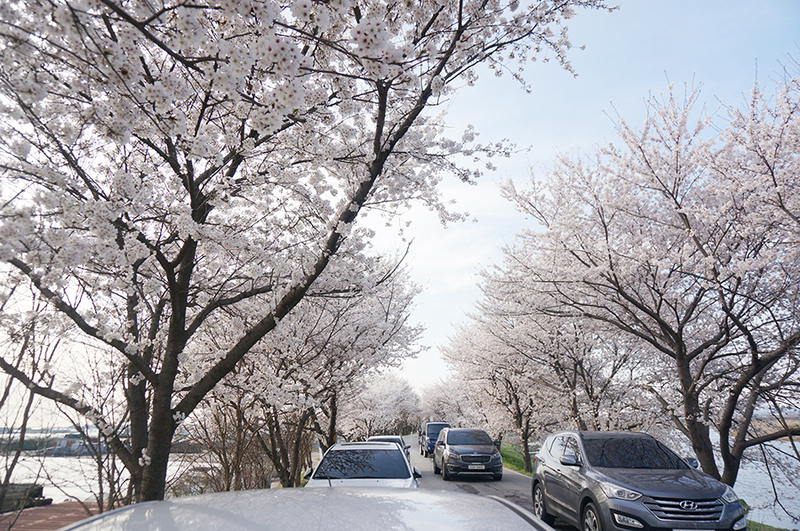 Cherry blossom is a festive season that we shouldn’t missed if we staying in Korea! yeah, it doesn’t last long enough!! this must be the perfect place for a drive!!! I will bring my parents there when they arrive in South Korea! I wish I had a car! However, late bloomers are in Paju-si now too! Now the other flowers blossoms are on the way! 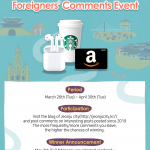 It’s clearly guide for foreigner who want to see cherry blossom in Jeonju! Thank you! Your experience looked so wonderful, Jeonju will definitely be on my list to visit next year during the cherry blossom season!! Get ready your camera gear next spring!! 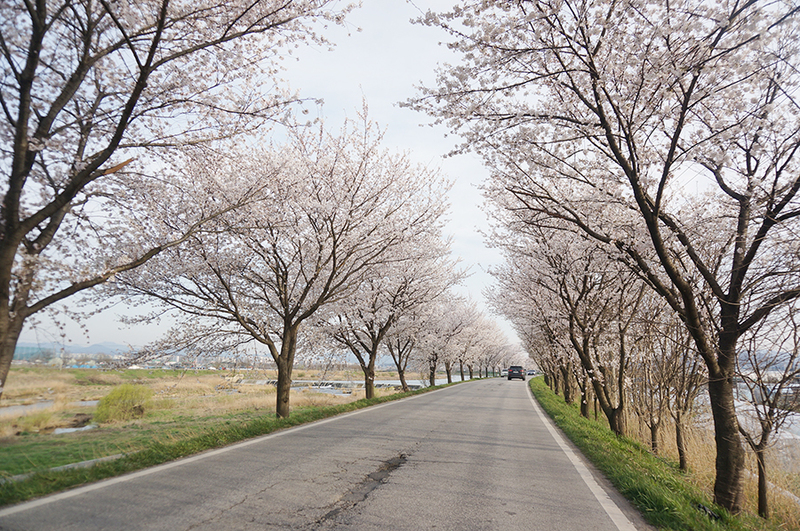 I wish i can have a drive under the cherry blossom trees!!! looks nice to do some work out there!! cherry blosoom in my mind, cherry blossom in my soul! Oh wow, this looks super pretty. I wish I knew it beforehand. Just imaging have a bicycle, couple of friends, and cover the whole route with them. This route is really well done, as you have a chance to fully view the whole beauty of this trees. Have already visited many places, and this is definitely on my list. This is absolutely gorgeous! As a photographer, I’ll keep this place in mind for next year, when cherry blossoms are blooming again. i dont wanna go from jeonju, mr stark.